Let’s go on a treasure hunt. 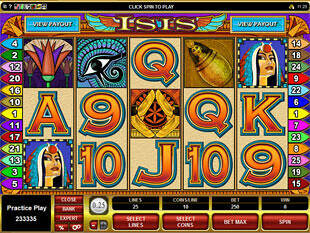 The Isis Slot Machine powered by Microgaming enters the realms of fancy. Would you like to meet the Egyptian goddess? You will have Isis at your service. I think it increases your chances to win. She was worshiped as the ideal mother and wife as well as the patroness of nature and magic. Magic? Yes, you are right. The game is made in the style of the ancient Egypt. The 5 reels are placed on the golden sand. There are 25 paylines that makes your target more attainable. The whole slot is imbued with the mystery spirit. You will notice it later when a big amount of prizes falls down on your head like the gifts from on high. Isis the goddess of superlative beauty is the wild symbol. She brings luck. Her magic will spread on the game if you catch 5 wilds. Do you know how is changeable the mood of women? That is why our perverse queen substitutes for all symbols except scatters. But as all majestic creatures she is fair. Her appearance on the reels won’t escape your notice. All the wins will be doubled with her help. Be vigilant against the Horus. It is the god in the form of a falcon whose eyes were the sun and the moon. It is the sacred scatter symbol in the video slot. The birds are your friends, so, if you notice them coming fly, in our case, on the reels, do not spring them. To the satisfaction of all concerned. You can choose the coin size from $0.01 up to $0.25. The slot promises well and gives great possibilities to win. You just need to use them right. For example, if you are oriented on the best result you should risk and put $250. 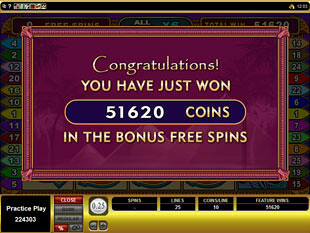 It is the max bet per spin in the play. 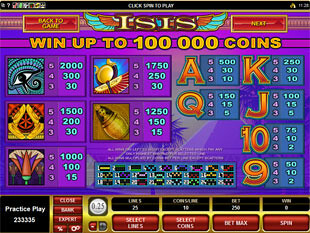 The top jackpot is 10,000 coins for 5 symbols of graceful Isis. A look of joy will come to your face when you get the award of $25,000. We are not gods so we need only worldly pleasures like the top win. Right? In the desert slot you will see 3 or 4 flying falcons that bring you 20, 25 Free Games accordingly. 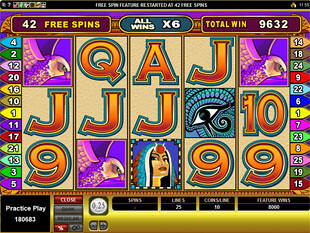 But when the wings of the Horus cover the whole reels you will get 30 Free Spins. Wins during the bonus feature are multiplied by 6 times. Yes, you read right! You won’t forget this moment of the jollity. Also if you take all the prizes we have offered but still want more you can pick the Gamble Game. Where you should guess the card suit and color. This breathtaking pastime can quadruple or double your stakes respectively. The Isis slot machine affords a round of pleasures! It includes all the best features and artistically done graphics that transfer you in the empire of Egyptian gods and goddesses. You won’t be able to pry yourself from the screen. The slot is so thrilling that I couldn’t put it down. Whichever you choose, you will have a good bargain. Prepare your pockets for big money!